Home › How to get 360 Waves Fast › How to get 360 Waves Fast – 4 Tips For Quicker Results! How to get 360 Waves Fast – 4 Tips For Quicker Results! Given that it can take anywhere from a few days to a few months for people to see results, one of the most common questions beginning wavers ask is “how long does it takes to get 360 Waves?”. Once they learn that the amount of time it takes a person to get waves varies based on the persons hair texture and the amount of time they spend brushing per day, they then want to know if there is anything they can do to speed up the 360 wave process. Over the past year, 360waveprocess-Rashaad has studied and tested four methods that are proven to help get faster results. These four method are discussed below and are sectioned off into four tips. TIP 1: The first tip/method to get 360 waves faster revolves around the brush you use. 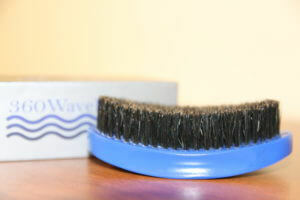 360WaveProcess Rashaad recommends that wavers build their 360 waves with either a medium bristle brush. A medium bristle brush is recommended because it can be used while wolfing as well as during a fresh haircut (A hard brush can also be used to build waves if your scalp is not tender). Medium and hard brushes have what 360WaveProcess-Rashaad likes to call “Pull”. Pull basically describes how well a brush is able to pull the hair with each stroke. For example, if you are wolfing, as a beginner trying to build waves, you may not want to use a soft bristle brush because the bristles are too soft and will be unable to pull/brush the strands of your hair that are deep under the wolf. If you need a good medium brush to start your journey, please check out the 360WaveProcess, Firm Medium boar bristle brush. It is designed with a curve so that it brushes more of your hair with each stroke when compared to a normal straight brush. The 3WP brush also has a side thumb grip that enables you to brush with more control. The brush is most important, but there are three other tips that will work with this first tip to help you get faster results. TIP 2: The second tip/360 Wave method deals with compression and Du-rags/WaveCaps. If you are trying to get faster 360 wave results you should be aware of how beneficial compression is. Compression is basically describing you will keep your hair under control while you are trying to train it. As we know you must have curly hair to achieve the waves hairstyle. The whole reason for brushing is to train your curly hair to lay down. As you brush your hair every day you are training your hair to grow in the laid down position that you are brushing in. As you train your hair with constant brushing, eventually it learns to grown in the direction you’ve been brushing. As time progresses you will start to notice a wave pattern forming. That is the process of getting waves. 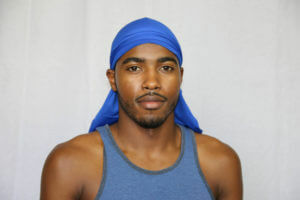 Wearing a doo-rag creates compression on your hair and helps it stay laid down. Your hair will learn how to lay down quicker than normal if you use a doo-rag. To get waves faster with a d00-rag you should always wear it to sleep. After a good day of brushing, you want to save and protect your work by wearing your doo-rag. Checkout The TsuRag for their unique style of string-less doo-rags. The Tsu-rag delivers great compression without the hassle of a string leaving a mark on the forehead as traditional doo-rags are known for. TIP 3: This third tip/360 wave method is based on Wolfing. Wolfing your hair for 360 waves if one of the best things you can do to get better and faster results next to actually brushing. The 360 Wave term, “Wolfing” means to abstain from a haircut for an extended period of time. It’s great to get a fresh haircut so you can see all of the progress that resulted from your brush sessions however, when you are in the beginning stages of getting 360 waves it is best to have long wolfing sessions. When you get a haircut before all levels of hair are fully trained to grow in the laid down positioned you’ve been working on by brushing every day, you cut off some of the progress you’ve made. 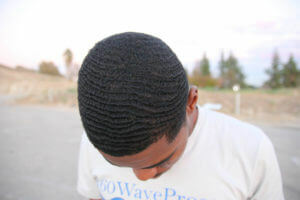 This is the number one reason why some guys feel like their barber, “cut of [their] 360 wave progress”. There is an optimal amount of time that you should wolf for. The optimal time to wolf for coarse hair wavers is anywhere from 4 to 8 weeks. If you are a beginner you should lean closer to 8 week wolfing intervals. This means you get a haircut every eight weeks. As your pattern comes in fully, you can begin to get a haircut every 4 weeks without loosing progress. After your wolfing session you should not get your hair cut lower than a #1 WTG if you are a beginner. TIP 4: The third tip/360 Wave Method relates to hair products and keeping your hair clean. Most beginners wonder about what the best hair product is that will help them get waves, but there is not best hair product to get you waves beside an actual brush. Hair products like pomade, olive oil, or grease don’t get you waves. Products like those don’t get you waves, they only make the waves you already have look better. With that being said, it is great to use good natural products that give your hair that extra shine and moist look. One of the best natural products I’ve tried is call cold label wave and scalp butter. It leaves the hair moisturized all day without drying out like grease does. It gives the hair a natural looking shine as well. Besides regular hair products to get waves faster with better results a focus should be placed on the shampoo and conditioner used. One should only shampoo their hair once or twice per week unless they use a natural shampoo that does not contain sulfate ingredient. After every shampoo you should use a conditioner to restore some of the natural oils that are stripped from the scalp during the shampooing process. The brand Shea moisture has an all natural shampoo called Shea moisture curl and shine shampoo that does not contain sulfates. I recommend that shampoo in conjunction with any regular conditioner. When i put on my durag little hairs stick out any advice? Would you advice the use of a blue magic indian hemp, herbal hair conditioner, or shea butter for someone with coarse hair. would the waves come faster or be better when the cream is thicker. I have curly hair now, I’m going to get it cut off to a 2 probably. How do I go about starting to get waves I already have durags. I have one question, I feel like I don’t know my brush pattern how do I figure out my brush pattern?